American Art Movement: Characteristics, History. No. 5, 1948 (1948) Private Collection. be worth in the region of $140 million. "Abstract Expressionism" is a vague term which refers to a general movement of largely non-representative painting, which flourished in the United States during the 1940s and 1950s. Spearheaded by a generation of American artists - strongly influenced by European expatriates - who had grown up during the Depression and were influenced both by World War II and its Cold War aftermath, abstract expressionist painting was neither wholly abstract nor expressionist and encompassed several quite different styles. Even so, the diverse exponents of Abstract Expressionism had several aims in common, not least a desire to redefine the nature of painting and in the process create a new type of art. Leading abstract painters who were associated with the movement include: Jackson Pollock (1912-56), his wife Lee Krasner (1908-84), Franz Kline (1910-62), Robert Motherwell (1915-91), Willem De Kooning (1904-97), Mark Rothko (1903-70), Clyfford Still (1904-80), Barnett Newman (1905-70), Josef Albers (1888-1976), Philip Guston (1913-80), Adolph Gottlieb (1903-74), and William Baziotes (1912-63). Second generation painters included Sam Francis (1923-94). The term "Abstract Expressionism" was initially coined in Europe to describe works by German Expressionist painters. Only later, in 1946, was it applied to American art by the art critic Robert Coates. An alternative label, "Action Painting", was coined in 1952 by Harold Rosenberg (1906-78) who, along with Clement Greenberg (1909-94), was the most influential critic and apologist of the new movement, which became known also as "The New York School." By 1955, Abstract Expressionism had become almost a new orthodoxy. Meanwhile, parallel movements in Western Europe were appearing under various titles, such as Art Informel (c.1945-60), along with sub-variants such as Lyrical Abstraction (late 1940s, 1950s), Tachisme (c.1945-60) and the COBRA group (1948-51). In Eastern Europe Art Informel was regarded as an expression of fervent individualism and Communist authorities rejected it entirely. Note: For earlier forms of expressionism, see: Expressionist Paintings. The America of the 1940s, from which Abstract Expressionism emerged, was still reeling from the collapse of world order triggered by World War II. This was a major influence on the country's artists - many of whom still remembered The Great Depression and its relief programs like the Works Progress Administration which had afforded them the opportunity to develop a painting career, and they began searching for ways of responding to the uncertain climate. The problem was that the two main art movements of the 1930s - namely, Regionalism and Social Realism - failed to satisfy their desire for a break with current thinking. In this, they were strongly influenced by the arrival of numerous modern artist refugees from Europe, whose radical approach to art opened up a series of new possibilities. These exiles included figures like the Armenian-born Arshile Gorky, who settled in the US in 1920, and the German-born Hans Hofmann who migrated to America in 1930, as well as the German Expressionist George Grosz (1893-1959), the Cubist Fernand Leger (1881-1955), the Bauhaus abstract painter Josef Albers (1888-1976) and the geometrical abstractionist Piet Mondrian (1872-1944). Other influential immigrants were the Dadaist Marcel Duchamp (1887-1968), and the Surrealists Yves Tanguy (1900-55), Andre Masson (1896-1987), Max Ernst (1891-1976) and Andre Breton (1896-1966). The Surrealist artists were especially influential, with their idea of unconscious 'automatic' painting which was taken up by Jackson Pollock and others. See also: History of Expressionist Painting (c.1880-1930). The significance of these artists for the new American movement was acknowledged as early as 1944 by Jackson Pollock himself: "The fact that good European Moderns are now here is very important for they bring with them an understanding of the problems of modern painting." The exchange of ideas was assisted in New York by a growing infrastructure of venues and exhibitions promoting modern art, such as The Museum of Modern Art (founded 1929) which hosted exhibitions of Cubism, various other styles of abstract art, Dada, Fantastic Art and Surrealism, along with retrospectives of Leger, Henri Matisse, and Pablo Picasso, among others. Works by Gabo, Mondrian, El Lissitzky, and other avant-garde artists were also shown at Albert Gallatin's Museum of Living Art. Another venue was the Museum of Non-Objective Painting (founded 1939), the forerunner of the Solomon R. Guggenheim Museum, which was noted for its collection of paintings by Wassily Kandinsky (1866-1944). The themes and ideas of European modernism were also disseminated through education. The German artist immigrant Hans Hofmann became a huge influence on painters, critics and the development of American modern art through his New York art school where he taught from 1933 until 1958. Lastly, one should not underestimate the role of art critics as well as wealthy patrons and collectors - notably Peggy Guggenheim (1898-1979), and Leo Castelli (1907-99) - who were active agents for the new movement. See also: Art Museums in America. Among indigenous painters, Albert Pinkham Ryder (1847-1917) is seen as an early precursor of expressionist abstraction. In addition, a key transitional figure linking pre-war with post-war American art was Stuart Davis (1894-1964), who brought a focused integrity to his pursuit of pictorial structure. (In a curious parallel with George Stubbs' months-long study of horse carcasses in order to improve his knowledge of equine anatomy Davis closeted himself for a long period in 1927 to study an egg beater). His contribution can be seen as an American extension of Cubism: he was at times close to Fernand Leger, but he used colour very differently, bright and clear, solid and flat. This together with his conspicious modernity, his use of the banal vocabulary of everyday urban life, was a decisive influence on artists of the 1940s and 1950s and then on Pop Art. Also significant were the Precisionists, a loosely unified group who portrayed contemporary America in a hard-edged, boldly coloured version of Cubism. For a time they included Georgia O'Keeffe (1887-1986), who in a long career developed an increasingly abstract imagery, based on magnified organic forms and the rolling windswept plains of Texas. But the two main forerunners of Abstract Expressionism were Arshile Gorky (1905-48) and Hans Hofmann (1880-1966), neither of whom were connected with the early expressionist movement in Germany. Gorky by 1942 had arrived at a very free, calligraphic brushwork, very bright in colour, often entirely without figurative reference. "I never finish a painting, I just stop working on it for a while." Hofmann established a profoundly influencial school in New York where he not only provided a forcefully articulated theoretical support for non-figurative art, but remained very open to the stimulous of the new. In particular he reflected symbolist ideas of the independence of the world of art from the world of appearances: he used colour to express mood as Kandinsky had, yet retained a feeling for structure that derives from Paul Cezanne (1839-1906) and Cubism. Anticipating Pollock, he even experimented with "drip" techniques in 1940, but his own most magical colouristic inventions, coming at the end of his life, express a radiant serenity very different from anything Pollock produced. Among Hofmann's acolytes was the art critic Clement Greenberg, a vigorous advocate of Abstract Expressionism, and among his students was the artist Lee Krasner who introduced Hofmann to her husband Jackson Pollock. In simple terms, the Abstract Expressionism movement encompassed two broad groupings. These included: (1) the so-called "action painters" such as Jackson Pollock and Willem De Kooning who focused on an intensely expressive style of gestural painting; and (2) the more passive "colour-field" painters, notably Mark Rothko, Barnett Newman and Clyfford Still, who were concerned with reflection and mood. That said, it is not always easy to draw a precise line between these two types of Abstract Expressionism, and several artists contributed to both. In 1947, after producing numerous "all-over" abstract paintings - see, for instance, Pasiphae (1943, Metropolitan Museum of Art) - Jackson Pollock, supported by his wife Lee Krasner (1908-84), developed a radical new technique (one that both Hofmann and Krasner had tried earlier) called "action-painting", which involved dripping thinned paint onto raw canvas laid on the ground using wide and rhythmic sweeps of a large and loaded brush (if a brush was used) or, more usually direct from the can - a far cry from the traditional painterly method whereby pigment was applied by brush to a canvas on an easel. Pollock worked in a highly spontaneous improvisatory manner, famously dancing around the canvas pouring, throwing and dripping paint onto it. By doing this, he claimed to be channelling his inner impulses directly onto the canvas, in a form of automatic or subconscious painting. For more details, see Jackson Pollock's paintings (1940-56). Pollock's paintings smashed all conventions of traditional American art. Their subject matter was entirely abstract, their scale was huge, and their iconoclastic production method became almost as important as the works themselves. This was because, for these Abstract Expressionists, the authenticity of a painting lay in its directness and immediacy of expression: in how the artist conveyed his inner impulses, his unconscious being. In a sense, the painting itself became an event, a drama of self-revelation. Hence the term "action painting". An important feature of this "event" was the "all-over" or shapeless character of the paintings. Pollock's works in particular seemed to flow beyond the canvas, being cut off only by the physical limits of the canvas edges. In short, Pollock (and others) jettisoned all the traditional concepts of composition, space, volume and depth, allowing the flatness of the picture plane to take centre stage. Not surprisingly, the paintings caused a sensation. The New York Times art critic John Canaday was highly critical, but Clement Greenberg proclaimed abstract expressionism in general and Jackson Pollock in particular, as the epitome of aesthetic value, enthusiastically supporting Pollock's work on formalistic grounds as the best painting of its day and the heir to an art tradition - stretching back to the Cubism of Pablo Picasso, the cube-like pictures of Paul Cézanne and the Water Lily series of Claude Monet - whose defining characteristic is the making of marks on a flat surface. Harold Rosenberg highlighted the "existential" nature of Pollock's work, stating that "what was to go on the canvas was not a picture but an event". Although Willem De Kooning is also grouped with Pollock in the highly charged active type of Abstract Expressionism, his works are different both technically and aesthetically to those of the latter. His violent and sinister Woman series of six paintings (1950-3), portraying a three-quarter-length female figure, exemplified his figurative style, although he also produced more abstract works. See also his earlier masterpiece, Seated Woman (1944, Metropolitan Museum of Art), a prototype for the Woman series. Like Pollock, De Kooning was a strong believer in the idea that an artist acted out his inner impulses, and that something of his emotion or state of mind could be read by the viewer in the resulting paint marks. "I paint this way because I can keep putting more and more things into it  drama, anger, pain, love... through your eyes it again becomes an emotion or an idea." Other important contributors to action painting include: Mark Tobey noted for his White Writing style of calligraphic gesturalism; Franz Kline, an artist whose works include colour field compositions as well as vigorous gestural work, sometimes compared to gigantically enlarged fragments of Chinese calligraphy); Robert Motherwell (in his series entitled Elegy to the Spanish Republic, and his powerful black and white paintings); Cy Twombly (in his gestural works based on calligraphic, linear symbols) and Adolph Gottlieb (noted for his abstract surrealist series including Pictographs, Imaginary Landscapes and Bursts). Artists associated with the technique of action-painting continue to be highly sought-after by collectors. 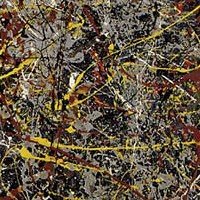 Both Jackson Pollock and Willem De Kooning feature in the world's Top 10 Most Expensive Paintings. Evolving slightly later than action-painting was a second style of Abstract Expressionism, which became known as Colour Field Painting. (An offshoot of this style was Josef Albers' Homage to the Square series.) It emerged as several important artists in America in the late 1940s and 1950s (eg. Mark Rothko, Clyfford Stills, Barnett Newman) were experimenting with the use of flat areas or fields of colour to induce contemplation in the viewer - even to a pitch of mystic intensity. They were very much on the passive wing of the Abstract Expressionist movement, in contrast to the agitation of Pollock or De Kooning, though it is hard to draw a definitive dividing line. Clyfford Stills' work, for example, can be thunderous in mood but is positively severe in contrast with Pollock's action. The work of these artists was on a very large scale, in which it differed sharply from the related investigations of Albers and others, the scale being necessary to the creation of the effect. The impulse behind Colour Field painting was reflective and cerebral, characterized by simple pictorial imagery designed to create emotional impact. Rothko and Newman, among others, described their desire to achieve the "sublime" rather than the "beautiful." A type of highly coloured minimalism, their style (according to Newman) aimed to liberate the artist from "all constraints of memory, association, nostalgia, legend, and myth that have been the devices of Western European painting." Rothko's own soft-edged rectangular shapes of glowing colour sought to envelop the viewer and trigger a semi-religious emotional experience, to the point of tears. Like Pollock and the action-painters, colour field paintings were executed on a monumental scale for optimum impact - not to invoke heroic grandeur but rather to influence and create an intimate relationship with the individual spectator. Rothko said, "I paint big to be intimate." The most distinguished of these colour-field painters was Mark Rothko. He has been described, along with Clyfford Still as the chief exponent of the "American Sublime". He first showed in 1929 and by about 1940 was working in a Surrealistic vein. By 1947, however, he was evolving the formula to which he was to remain faithful for the rest of his life. This formula, though generally interpreted on a monumental scale is almost as simple as Josef Albers' square. Mark Rothko's paintings typically comprise two or three horizontal or vertical rectangles of different colours, varying in width or in height, on an even coloured background. The rectangles are filled with colour, which is washed or stained with shifting tones and luminous intensities, and their edges blur into soft-focus. This blurring of edges makes the colour seem to float. So powerful and intense is the impression of mysterious radiance flooding from these great canvases, that viewers themselves can also experience a floating sensation. Clyfford Still, always a detached figure, also worked on a very large scale. His signature style being a heavily impastoed, jagged form, silhouetted in dramatic contrast against a broad, even plane of colour. Barnett Newman, associated with Rothko and Motherwell in the founding of an Art School on 8th Avenue, New York in 1947, worked for a time on the magazine The Tiger's Eye, which voiced the opinion of many of the group. In his mature work he arrived at even more simplified solutions than Rothko and was never influenced by the gestural painting of Pollock. In his formula, however, the mystical aim is distilled down to the sparsest symbolic geometry, involving a rectangular canvas featuring an area of colour divided by one or more vertical stripes. His work is unimpassioned in character and essentially cool. Other Colour Field artists included William Baziotes, who was close in mood both to Mark Rothko and Barnett Newman, except he developed a style that verged on the figurative as theirs' never did. His paintings contain relatively complex shapes suggestive of animate or inanimate forms; Philip Guston (1913-80), who had his own highly personal variation, sometimes called "Abstract Impressionism", from which he moved on to a more expressive style in the late 1950s; Adolf Gottlieb, a close contemporary of Clyfford Stills, exploited Surrealist imagery in the 1930s but was also deeply interested in American Indian Art and from this he developed in the 1940s his so-called "Pictographs" characterised by very Freudian imagery. Another important figure in the development of Colour Field painting was Helen Frankenthaler (b.1928), who began as a Cubist before exploring Abstract Expressionist styles in the early 1950s, making a significant development of Pollock's "drip" technique. Mark Rothko's painting White Center (1950) sold at auction in 2007 for a record $72.8 million. See the World's Top 20 Most Expensive Paintings. An offshoot of Colour Field art which explored harmony and proportion in Abstract Expressionism, was developed by the German painter Josef Albers, from 1933 a teacher at Black Mountain College in North Carolina. In his teaching he investigated the relations between geometry and colour in a series of paintings, entitled Variations on a Theme. After moving to Yale in 1950, he began his sequence called Homage to the Square. This massive body of work consisted of hundreds of paintings and prints all within a square format. Though they vary in size they all feature three or four squares superimposed - a nest of squares positioned with vertical but not horizontal symmetry. Albers used the formula to demonstrate his abiding belief in an essential dichotomy of art - "the discrepancy between physical fact and physic effect" - thus the linear structure of his square pictures is of the most simple clarity. The colour structure is created likewise in evenly applied paint, straight from the tube. The colour of each of the three or four squares usually has no variation of intensity, and so is completely inexpressive of any quality other than it's particular tone. In the eyes of the onlooker, the flat picture plane becomes three-dimensional as one colour seems to advance, another to recede, according to its contrasting nature. Furthermore, the pure evenness of colour within each square is affected optically by its reaction to its neighbours, and all the colours change in character as the light in which they are seen, changes. Some art critics have compared Albers' Homage to the Square series to Claude Monet's famous Water Lily paintings, except Albers' heirs were the Americans of the late 1950s and 1960s who, while respecting the Abstract Expressionism achievement, found in his work a pattern and an intense colour sensation on which they could build. Later again, his interest in perception became relevant for Op Art and even Conceptual Art. For other movements similar to abstract expressionist painting, see Art Movements, Periods, Schools (from about 100 BCE). The first generation of Abstract Expressionist artists flourished between 1943 and the mid-1950s. They had a major impact on the reputation of American painting, leading to the establishment of New York as the centre of world art. The style was introduced to Paris in the 1950s by Canadian artist Jean-Paul Riopelle (1923-2002), who received great assistance from Michel Tapié's seminal book, Un Art Autre (1952). Michel Tapié also promoted the works of Jackson Pollock and Hans Hofmann in Europe. At the same time, new American sub-movements like Hard-edge painting appeared, exemplified by artists like Ad Reinhardt (1913-67), Frank Stella (b.1936), Jules Olitski (b.1922) and Al Held (b.1928). In Europe during the 1940s and 1950s, abstract expressionism was known as Art Informel (art without form). Sub-variants of Art Informel included: Tachisme (c.1945-60), marked by the irregular use of splotches of colour. Exponents included artists like Jean Fautrier (1898-1964), Georges Mathieu (1921-2012), Maria Helena Vieira da Silva (1908-92), Pierre Soulages (b.1919), and the American artist Sam Francis (1923-94). Closely related to tachisme is Lyrical Abstraction, a softer type of abstract painting, that eliminated some of the more subjective elements of Art Informel - a style exemplified by Nicolas de Stael (1914-1955), Jean Paul Riopelle (1923-2002) and the colourist Patrick Heron (1920-99). See also: COBRA group. The term Lyrical Abstraction was also employed in America during the early 1960s, to refer to a purely abstract style of Colour Field painting which appeared in works by Helen Frankenthaler, Morris Louis (1912-62), Kenneth Noland (b.1924) and others. It dispensed with the emotional, or religious content of the earlier style of Abstract Expressionism, as well as the highly personal or gestural application associated with it. In 1964, the art critic Clement Greenberg curated an influential exhibition ("Post-Painterly Abstraction") of works by 31 artists associated with this development at the Los Angeles County Museum of Art. The show subsequently travelled to important art museums across America. Meanwhile in Britain during the 1960s, a new variant of Colour Field painting appeared in works by Robyn Denny, John Hoyland, Richard Smith and others. By the 1960s, the main effects of Abstract Expressionism had been thoroughly absorbed, although its themes and techniques continued to influence later artists from a variety of different schools, including Op Art, Fluxus, Pop Art, Minimalism, Post-Minimalism, Neo-Expressionism, and others.  For post-1970 artworks, see Postmodernist art.  For a list of schools and artist-groups, see Contemporary Art Movements.  For more about the evolution of painting, see: Visual Arts Encyclopedia.